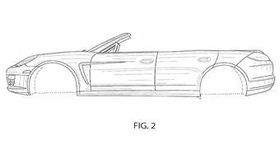 A side view of a proposed Porsche Panamera convertible, from a patent application. STUTTGART -- A series of European and U.S. patent applications show that Porsche AG remains committed to building a four-door convertible version of its flagship Panamera, despite recent comments from company insiders indicating the car had been canceled. The new car has a practical four-door body instead of the two-door route taken by all of Porsche's upmarket rivals. The layout, without a traditional B-pillar, has required substantial stiffening to the Panamera's floorpan and bulkheads to ensure sufficient structural rigidity and integrity. The Panemera convertible is depicted in official drawings that accompany the latest Porsche patent applications filed in February and ontained by AutoWeek, Automotive News Europe's sister publication. The move to bring a four-door convertible to showrooms is a bold one that carries far higher development costs than a more conventional two-door open-top car. But with carmakers seeking to establish unique selling points for all of their models, it's one that could provide Porsche with a valuable sales advantage as it seeks to expand the Panamera line. Although rumors have long hinted at an open-top version of the Panamera, it was thought Porsche had abandoned its original plans for a four-door in favor of a less-expensive two-door variant with a shortened wheelbase. However, with Porsche continuing to develop its patent applications for the four-door, it appears those original plans are now back on track at the behest of new parent company, Volkswagen AG. VW boss Martin Winterkorn is said to be a big supporter of the new car. By retaining a four-door layout, the Panamera convertible can offer the same interior space as its sedan sibling, although the luggage capacity is likely to be compromised by space needs for the folded roof and associated hardware. While the patent applications filed by Porsche don't specify the style of the roof for the Panamera convertible, the design of car's rear end suggests it will be a traditional fabric top. The Panamera convertible retains the same basic dimensions as the hardtop sedan, but the windshield has been altered with greater rake and, as seen on one of the drawings from Porsche in-house designer Grant Larson, it also gains additional supports within the small quarter windows low down on the A-pillars. While other carmakers, including Mercedes-Benz with its elegant S class-based Ocean Drive concept car, have toyed with the notion of introducing a four-door convertible in recent years, the requirement for substantial stiffening and added weight has often proved a stumbling block. However, advances in engineering through the development of high-strength steel and tailored blanks (sections of steel in varying thicknesses) has brought down development and production costs to a point where they are now being considered as part of new model plans by many companies.